When seasonal dishes collide with beautiful presentation, the combination gets my attention every time. In Simple Fare: Spring and Summer, that beauty of presentation extends to the book itself with a clean, modern layout and large, stunning photographs reminiscent of the style of Donna Hay. As I read my review copy, I quickly fell for this simplicity that comes packed with special touches. The author, Karen Mordechai, believes “food should capture your spirit.” What you cook and what you’re drawn to evolves as you do, and food “is at the foundation of our cultures.” By sourcing the best of the current season and sharing meals with family and friends, “we help sustain a beautiful cycle of goodness.” The Burnt Carrots dish is just carrots roasted with a coating of maple syrup and olive oil, but it’s served with marinated labneh, toasted hazelnuts, and nigella seeds. The Ricotta Gnudi is plated with an easy mix of brown butter and purple basil leaves, but the dumplings are made with a mix of plain, homemade if possible, ricotta and smoked ricotta. The Cured Eggs are shown with two variations. They can be pickled with a beet to turn the outside pink or with saffron to turn it yellow, and the pink option looks lovely in the bowl of White Miso Soup. There’s nothing too complex or time-consuming about these dishes, but they all offer nice, added touches. 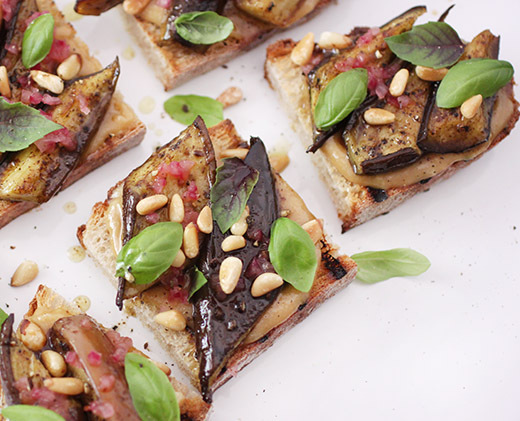 For instance, for the Eggplant Crostini shown here, there’s a flavorful tahini spread that holds everything in place on the toasted bread, a tangy black garlic dressing, and toppings of pickled red onion, toasted pine nuts, and fresh basil. I had just brought home some farm-fresh eggplant that was perfect for it. Wedges of eggplants were cut and tossed with olive oil, salt, and pepper before being roasted until browned and crisp. The tahini spread was made by mixing tahini with a minced garlic clove, some lemon juice, and olive oil. Next, the dressing was made by pureeing black garlic cloves with pomegranate molasses, lemon juice, sumac, cocoa powder, salt, and olive oil. I had made the pickled red onion in advance by thinly slicing an onion and covering the slices with a brine of white vinegar, lime juice, and salt with a bay leaf. The roasted eggplant wedges were tossed with some of the dressing before building the toasts. 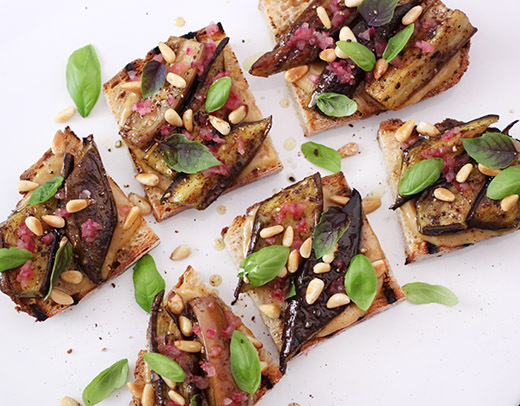 To put it all together, toasted bread was spread with the tahini mixture, the dressed eggplant wedges were nestled into the spread, more dressing was drizzled on top, and garnishes of pickled red onion, toasted pine nuts, and basil leaves were added. I love a composition that’s put together well like this. The tahini spread is an excellent glue to keep everything in place as you pick up each piece of bread. A great punch of flavor is delivered here by the black garlic dressing. The sweet and funky, fermented garlic combined with pomegranate molasses, lemon, and sumac made the roasted eggplant sing. Simple, fresh food with interesting details, that’s as pretty as it is tasty, never goes out of style. Recipe reprinted with publisher's permission from Simple Fare: Spring and Summer. This eggplant dish is warm and bright. It works well as a starter or as a light meal, served with a side of greens. The roasting technique is inspired by a method from London-based chef Yotam Ottolenghi. Preheat the oven to 400oF (205oC). Cut each eggplant into half lengthwise, and cut each half into half widthwise. Cut each quarter into thirds to create thick wedges. In a large bowl, toss the wedges with the olive oil, salt, and some pepper. Arrange the wedges on two parchment-lined baking sheets and roast until golden and slightly crisp, but not dry, 35 to 40 minutes. For the tahini spread: Combine the tahini, garlic, lemon juice, and olive oil in a food processor and blend until smooth. The mixture should be spreadable, but not overly thick. If you wish to thin your tahini, add a thin stream of up to 1⁄2 cup (120 ml) ice water to the mixture with the motor running until your desired consistency is reached. Set aside. For the black garlic dressing: Pulse the garlic, sesame paste, molasses, lemon juice, sumac, cocoa powder, and salt in a food processor to form a paste. With the motor running, add the olive oil in a slow and steady stream until completely incorporated. 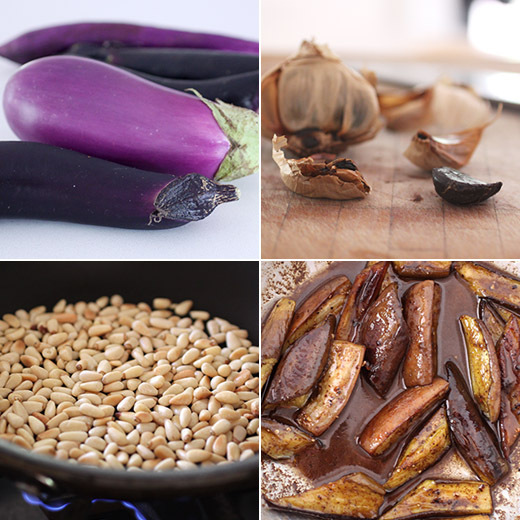 Remove the eggplant from the oven and, while still warm, gently toss it in a large bowl with the black garlic dressing until completely coated. Set it aside to let the flavors meld. For the toast: Heat a grill to medium-high or a grill pan over medium- high heat. Brush each slice of bread with the olive oil and toast for about 2 minutes on each side, until lightly brown. To serve, spread each piece of toast with a bit of the tahini spread and top with a few wedges of warm eggplant. Garnish with pickled red onions, a sprinkling of pine nuts, and basil leaves. So pretty! Those crostini look amazing. This really is pretty. Love eggplant -- neat way to serve it. Thanks! Simple yet elegant presentation! They look delicious. such little bites but they must pack such a punch of flavor! thanks for sharing these recipes! Oh these little gems look delicious and tasty, gorgeous!! Such a lovely appetizer! I need to start the hunt for black garlic.